Everyone loves having their hard work and dedication acknowledged, and this impressive little trophy is a great way to award dedication to ballet. A ballerina sits atop a shimmering pink column embellished by an insert holder. 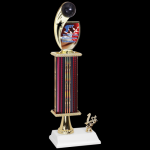 Choose the insert or graphics you want to customize the trophy to your event. A rising 3 star trim completes the trophy, all mounted to a black weighted base with plenty of room to personalize. 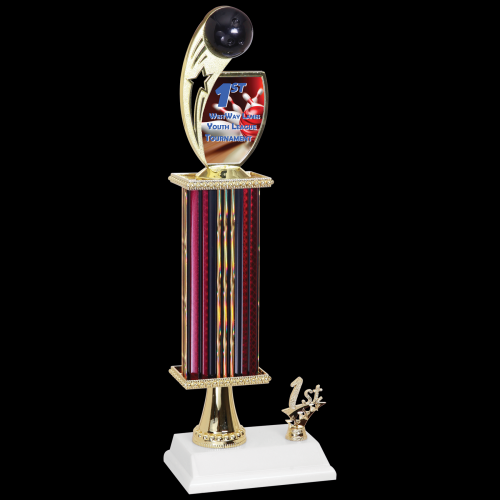 Dazzle your winning team with a traditional style trophy that features a full color basketball supported by gold wings. The column adds height and dimension and is mounted to a white weighted base with ample room to personalize for your event. A full color basketball trim also embellishes the base and completes a perfect recognition for those who soar above the rest on the basketball court.